The trade deadline is 25 days away, and with so many teams bunched up in the middle of the standings, there could be a serious shortage of talent available for teams looking to upgrade. In particular, available hitters seem to be particularly scarce, as the few sellers that exist in the market are mostly going to be selling veteran pitchers. Between Cole Hamels, Johnny Cueto, and Jeff Samardzija, some pretty good arms will likely change teams in the next few weeks, but for teams like the Pirates and Cardinals — who could use a bat far more than another arm — the pickings are beyond slim. Right now, in fact, it appears that the best hitter likely to change teams before the deadline is Brewers first baseman Adam Lind. Yes, the same Adam Lind who was traded for Marco Estrada over the winter, because the Blue Jays didn’t really want to pay him $7.5 million to DH for them. Lind wasn’t exactly a hot commodity during the off-season, and given his track record, it’s not hard to see why teams weren’t exactly falling all over themselves to add him to their line-up. 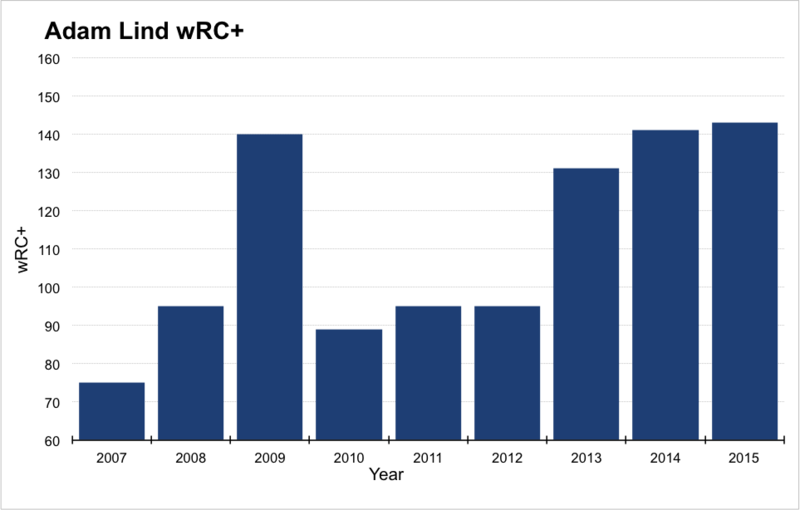 Here are Lind’s seasonal wRC+ marks by year since he broke into the big leagues. In five of his nine seasons, Lind has posted a wRC+ below 100, which is replacement level performance for a first baseman with no real defensive value. In the other four seasons, though, he’s posted a wRC+ of 131 or higher, and three of those four years he’s been over 140, including this season, where he’s at 143. Lind has either been great or terrible, and never anything in between. This kind of inconsistency is hard to fathom. If you’re an optimist, you can easily look at Lind’s performance since the start of the 2013 season, and note that he’s sustained excellence at the plate over the last two and a half years: .300/.368/.498 over nearly 1,200 plate appearances. His 137 wRC+ over that span puts him squarely between Edwin Encarnacion and Anthony Rizzo on the first base leaderboards, and not that far away from the top tier of highly-paid sluggers. If you’re a pessimist, you’ll note that Lind has been heavily platooned throughout his career, with 77% of his career plate appearances coming against right-handed pitchers. He’s hit just .213/.258/.331 against southpaws in over 900 plate appearances, which adds up to a pitiful 54 wRC+. And it’s not like his recent improvement has been fueled by improvement against same-handed pitchers; he’s running a 63 wRC+ against LHPs this year. Since putting up a 100 wRC+ against LHPs in 2009, Lind has fallen apart against lefties, putting up a 34 wRC+ in 575 PAs against LHPs over the last five and a half years. Even applying some regression to the mean — Lind is unlikely to actually be a the worst hitter in baseball against lefties, given how good he’s been against righties — Lind is still clearly a platoon player, and the kind of guy you even have to consider pinch-hitting for against a tough lefty in a high leverage situation. So that’s a problem, especially for a team that is expecting to have a lot of high-leverage situations in the postseason. Given how much more heavily bullpens are used during October, it wouldn’t be surprising at all to see a manager start playing the match-ups against a guy like Lind as early as the fifth inning, and maybe even earlier in an elimination game. So any team acquiring Lind for the postseason has to understand his limitations, and can’t just look at him as a guy they can shove into their line-up and assume their offensive problems are solved. And yet, even with those struggles against left-handers, the fact remains that Lind has been one of the betters in baseball for the last 30 months, and production against right-handed pitching is more valuable than production against left-handed pitching, given the predominance of RHPs in the sport. So while Lind has a very clear and identifiable flaw, he’s still a pretty valuable role player, especially if you anticipate facing a number of RHPs down the stretch. And that brings us to the Cardinals and Pirates, the two contenders who most obviously need a first baseman. Both happen to play in the National League Central, which continues to be a division that leans very heavily to the right side of the mound. The NL Central has Jon Lester, Francisco Liriano, occasional starts from Jamie Garcia, and then a whole bunch of right-handed pitching. There’s no better place in baseball for Adam Lind than this particular division, which likely played into the Brewers thought process when they acquired him in the first place. It’s somewhat fortuitous that the two teams most in need of his services also happen to play in the NL Central. The Astros and Rays could potentially use a guy like Lind as well, but neither one seems like quite as good a fit as Pittsburgh or St. Louis, both of whom are running out replacement level options but still have very good chances to reach the postseason thanks to the huge divide between the good and bad teams in the National League. So, barring the Brewers current eight game winning streak continuing on for another couple of weeks, it looks like the most likely scenario is a bidding war between the NL Central’s two best teams for the best available first baseman, with the loser perhaps settling for someone like Mike Napoli as a consolation prize. Despite his platoon problems and general inconsistencies, Lind is probably worth paying for; ZIPS forecasts a 131 wRC+ going forward, with Steamer being a little bit more conservative at 119. Pedro Alvarez and Mark Reynolds project to be closer to league average, so Lind represents a pretty solid upgrade over both team’s internal options, and Alvarez’s defensive problems at first make him a difficult player to stick in the line-up in a postseason game. Lind isn’t going to attract the kind of attention that a guy like Justin Upton would, but for St. Louis and Pittsburgh, it’s probably worth betting on the good version of Adam Lind hanging around a while longer. His inconsistent track record is an issue, but given what’s out there, there just aren’t very many legitimate alternatives for offensive upgrades. We hoped you liked reading The Pros and Cons of Adam Lind by Dave Cameron! Does fangraphs not have editors? I’ve never seen a website have so many basic errors that a simple proof read would solve. Most go unfixed even after print, surprised to see this one got fixed. How’d you like the price?